This luxurious minky blanket has been finished with a coral satin ruffle. 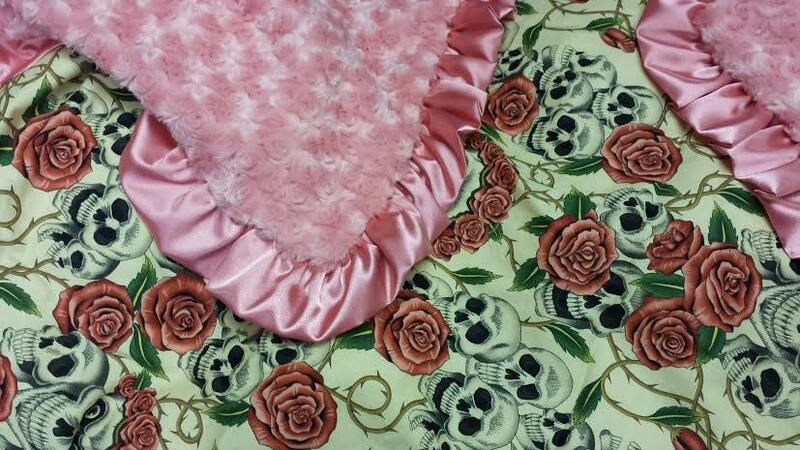 It has a 100% cotton skull roses fabric on top, and coral minky rosebud on the reverse side. This blanket also looks great with red minky rosebud on reverse and a red satin ruffle. This blanket is made to order. Please allow 5 - 7 business days for item to ship. This blanket is absolutely the cutest. Got it for my sister whom is ready to deliver anytime. She adores it. Love the work. Its perfect. she loves it!!!! she sent me pics and its beautiful:) Yet another reason to love the crafters of Etsy! fair price and quick ship. thanks!